I've bragged before about my VooDoo lily. Blooming right now in my garden is the Carrion Flower. 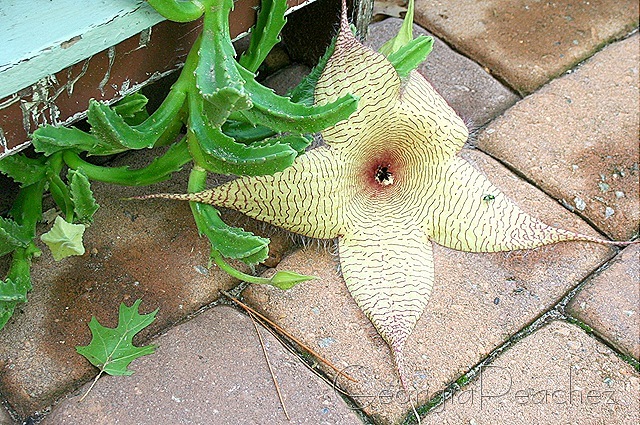 From the genus Stapelia this succulent has a large bloom that once it pops open smells a bit like carrion or dead meat. 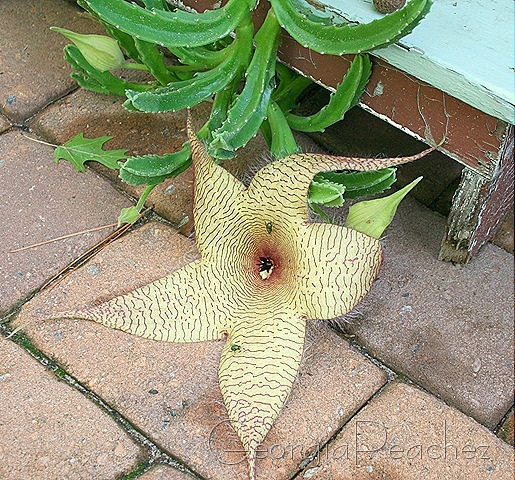 That's because this weird beauty of the garden needs to attract flies for pollination. Once this bloom pops open it's quite large, about 10 inches across. It's got long fuzzy hairs on it too. Awesome. I’ve heard about those! I think there is one kind of like that but bigger here in Chicago. Botanists are totally confused by it, because it isn’t supposed be able to grow and survive in our climate. Yet every year, it blooms again! Sometimes you just make me smile…this is such an odd and yet beautiful plant!!! …and after all, who doesn’t love the smell of dead meat?